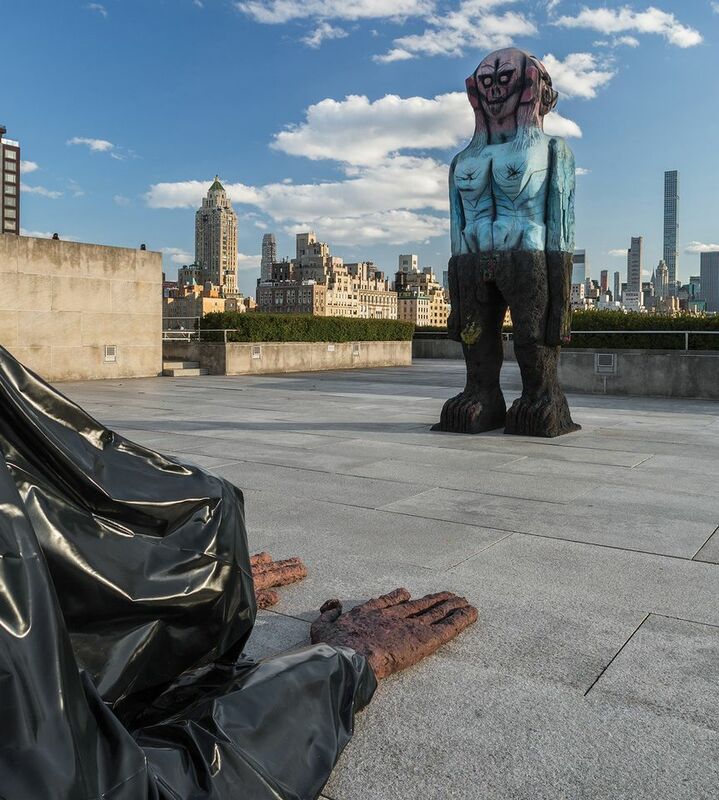 “We come in peace”, the often-copied line voiced by aliens from the film The Day The Earth Stood Still (1951), is also the title of the Pakistani-born, New York-based artist Huma Bhabha’s bronze sculptures unveiled today on the Metropolitan Museum of Art’s Iris and B. Gerald Cantor Roof Garden (17 April-28 October). The eerie scene of extraterrestrial visitation is recreated in the site-specific installation: a five-headed 12-foot-tall humanoid figure, We Come In Peace (2018), faces an 18-foot-long bowing blob, Benaam (2018) which is the Urdu word for “without a name”. Sheena Wagstaff: I’d like to lead off with a comment by the art historian Thomas McEvilley in which he describes that the “present, which seems barren and unpromising, still yet carries the power of life and the advance of civilization from past to future and future.” Then he specifically refers to your work as including “the most profound of themes, both the question of human nature and the involvement of present life, with the mysterious fertility of history.” The word that I take out of that wonderful description is “civilization,” which is a received term of the Enlightenment. What does civilization mean to you? How do you respond to McEvilley’s statement? Your use of bronze similarly draws on a traditional material with global historical origins, technical refinement, and ongoing use. When you cast something in bronze, like the figure in the backyard of your studio, it’s extraordinary that it doesn’t evoke this hard obdurate metal but instead looks like a facsimile of the original media that are prone to disintegration. Is the issue of material authenticity an issue for you? Or is bronze simply an expedient means by which to make a permanent embodiment of a fragmented and environmentally hardy work? The only way I can present my work outdoors is to make it bronze. I love styrofoam, found scraps of wood and meral and other garbage; I have used materials in my art for a long time – maybe because I’m interested in collage and assemblage but also because there is an element of chance in picking up these free materials that can lead to very beautiful results. The fact that I’ve given them another life is important to me. HB: Maybe the way the two figures on the roof connect [is] by being summoned, coming when the other calls. I think if the sculptures were seen separately they would inspire darker interpretations, but the combination of the two on the Met roof creates a dialogue and a narrative that implies some kind of communication from which hope can derive.